D&D Encounters week 12 – Vampire Kills and kills and kills; … and kills. In a moment of inspiration brought about by the sad look in a girls eyes as her first character was mercilessly slaughtered last week, I had her character rise as an undead. Belgos the ranger heard the whispering of the Raven Queen in her ear. She said something along the lines ofMy plans for you are not yet finished. Will you rise and be my champion, as a vampire? 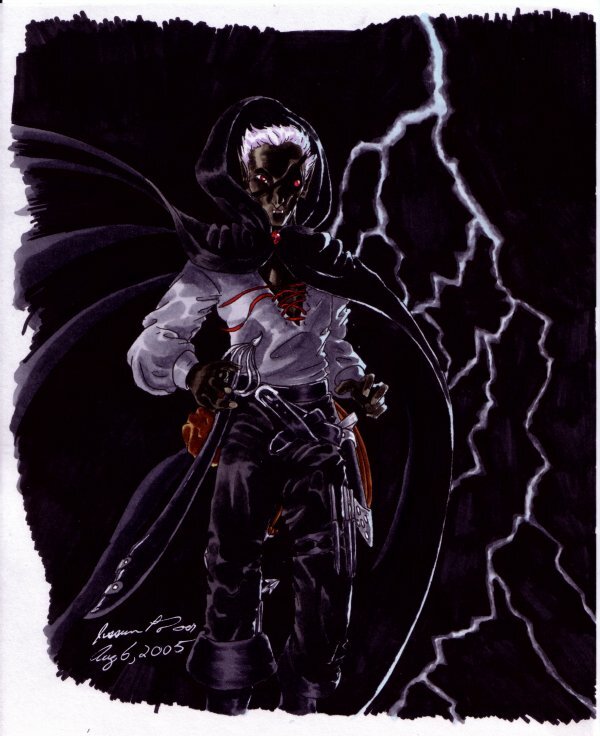 She jumped at the chance, Kinala the 2nd level vampire rose to begin life anew (or un-life un-new I guess) Anyhow, to make a long story short, tonight’s encounter featured a new 2nd level drow vampire from the newly published Heroes of Shadow. To make a long story even shorter, she made 4 slam attacks in 4 turns, rolled 4 criticals and killed 4enemies. It was an incredible sight to behold, a woman scorned by death, to be reborn as a vampire and wreak such unholy vengeance upon her enemies. By the end of the battle she would sweep in and envelop them with her cloak. and leave not but a pile of bones in her wake. Continuing on in an effort to make a short story longer. In addition to the usual suspects from the past three weeks, a new player joined tonight as Merrick the first level halfling. He joined up with the party just as they were checking for loot, and he opened two of the chests, to find a potion of haling and some ghoststrike oil. Our other rogue Erimikus found a suit of magic armour and a magic staff, which he traded in for a healing potion. Im not sure where the armour ended up… As they were searching, strange things were happening, as though tears in the fabric of time were allowing glimpses into the past. They step into the hall to see lights flashing from underneath the door opposite the one they just exited. Fargrim went with the kick in the door approach, and they were greeted with another vision, this one of some wizard talking about stuff. They crowded into the room to get a glimpse of the vision, and when it ended, there were 6 devilish duerger dwarves un-freezing from time. Fargrim charged his most ancient of foe, and that brought them fully to life quickly. The whole party except Jarren missed the first round of combat as the three guards moved up. He hit two of the guards with an explosive globe of lightning. Then the three scouts fired their deadly crossbows from the shadows. Merrick was targeted but luckily avoided the deadly black crossbow bolt fired from the shadows. The cleric Valenae was not so lucky, and took a bolt to the chest, and the third crossbow went flying high, aimed at Jarren at the back of the party. Fargrim noticed a statue in the center of the room was actually the god of dwarves, Moradin, and felt a power surge through him if he got close enough. Erimikus dodged into the room and threw his dagger from a sneak attack, then charged the third dwarf, stabbing him with his flaming dagger. He damaged the dwarf mightily, but it was Valenae and her fury that finally brought the dwarf low. His helm rung like a bell with her mighty blow, dropping him to his knees, then to his face. Only the dwarf scouts were left, and they were hidden from most. Kinala knew where one was and she strode across the room, and tore the first scout up into smithereens, her third critical. With only two scouts left, the party surged forward, and they each began to suffer from the attacks. He weathered blows from Erimikus, Hagen, and Fargrim, before Kinala turned her blazing eyes on him. The scout quailed before her might, and the fourth critical of the night slaughtered the deurger like prey. The rest of the party surrounded the last dwarf scout who thought about running, then decided he would die like his brothers, in honorable combat. It didn’t take long, he was backed into a corner and beat on by whoever could get to him. It was Fargrim who finally managed to get close enough to the statue of Moradin to feel his blessing, and his hammer shone with holy light as it flashed across the room to slam into the head of the last evil demon dwarf. He fell, slain, with the party victorious. One other interesting thing, is that Fargrim decided he would like a taste of blood, and he will be back for the final encounter as a dwarf vampire. We will just say that he and Kinala had a few private moments together during the short rest, and Fargrim came out of it looking pale, sharp-toothed, and far grimmer than before. Planet Stalingrad is a unique planet on the rim of Imperial Earth space. The crystal oceans of Stalingrad provide for a rich strain of promethium not found elsewhere. The major continent, called Stalingrad Prime, has for this reason become an all-encompassing manufactorum-city that spans the entire continent. At its peak, Planet Stalingrad was home to over 1 billion souls. The landmass stretched a quarter of the way around the northern quadrant of the globe, divided by numerous rivers which all begin their trek from the springs in the arctic mountains. The rivers are what gives the promethium to the crystal sea, and the largest processing plants straddle the mouths of the rivers as they pour into the seas. Along the riverbanks, which snake for hundreds of miles across the landscape, the most influential and rich have their land-holdings, including the planet’s fortress-palace on an island in the confluence of the world’s two greatest rivers, the Dnep and Volka Rivers. Once a member of the Empire, the planetary government chose secession when they realized how important the crystal seas of the planet had become. The planet hosted its own chapter of Space Marines, called the White Guards, who helped defend the planet, along with its Planetary Defense Force, for two decades against the might of the Imperium, until they found their doom in a Tyranid invasion fleet. With the empire standing by with their weapons sheathed, Planet Stalingrad was decimated by the mindless hordes of the Tyranid, who swooped in, annihilated all life on the planet, and moved on. Now a relief force has come to bring Planet Stalingrad back into the fold, and once it is secure, the empire will begin sending colonists to repopulate the world. The vanguard of the counter-invasion force is 7th Company of the Blood Angels, known as Satyr’s Raiders. The dreams of Empire are however being checked by a great host of orks. Led by Zigzag, the ork raiders who call themselves the Totem Goffs, have been pouring troops onto the planet for the loot left unattended. In a stolen imperial battleship re-christened the Deff’s Head Totem, the pirate Zigzag is a force to be reckoned with, and as the orks return to their stolen ship with more and more loot, Zigzag has become blinded by the lust for wealth. From a secret moon-base, he sends his troops down to the planet and chuckles to see the Imperium send more and more fodder into the meat-grinder known as Planet Stalingrad. The idea for the Stalingrad campaign came out of the need for my son and I to find a wargame to play together. Originally it was meant to be a WW2 game, and I have always harbored a fascination for the urban fighting of Stalingrad in World War 2. So, to make a long story short, we came up with this idea once we were sure Warhammer 40k was the game for us. This campaign is a chance for us to learn the rules, throw some dice, and hopefully wrest a planet from spend some quality time together, blasting away at each other’s armies with bolters and shootas. We are starting small and ignorant of most of the rules. We have so far played four battles, including when we played as a team (Orks and Space Marines, I know, right?) twice at our local friendly game store. The first game we won, but the veteran whom we played was using an experimental army. The second battle we lost, but it was difficult because there was little to no hand-holding, and sometimes our opponent would be quietly moving and rolling so fast we had no idea what was hitting us. Luckily at home, we can learn at our own pace, though there is no guarantee we are learning correctly. Also, there are some rules that you just don’t get unless you play against veterans. The idea that you cant measure before taking a shot, but have to guess and hope it is within range, is one such rule. Nonetheless, we are making some progress, and last night included vehicles, assaults, and plenty of difficult terrain. At the time of this battle, the Space Marines army was valued at approx. 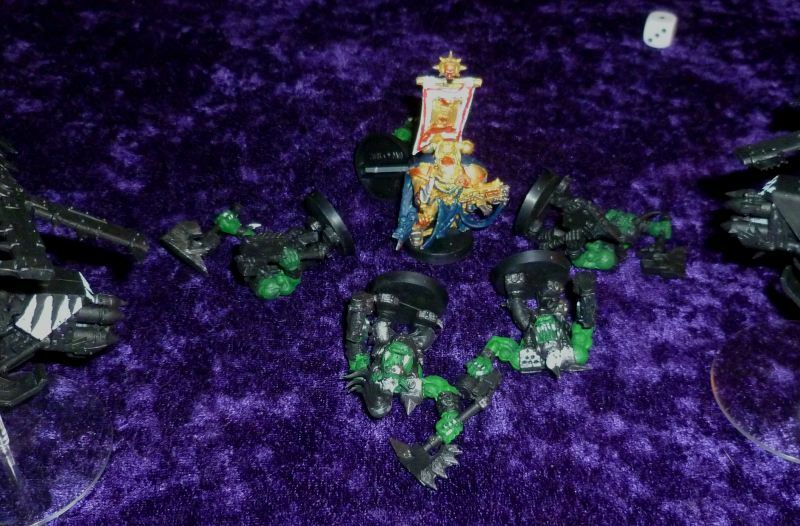 770 points, while the ork army was valued at approx. 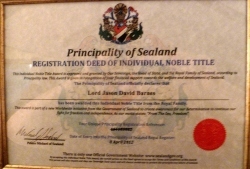 715. The reason for the questionable points is that I was using his partially built Rhino as a looted transport with no options, worth 35 points, and I also upgraded all my nobs to ‘Eavy Armour and Twin-linked shootas. 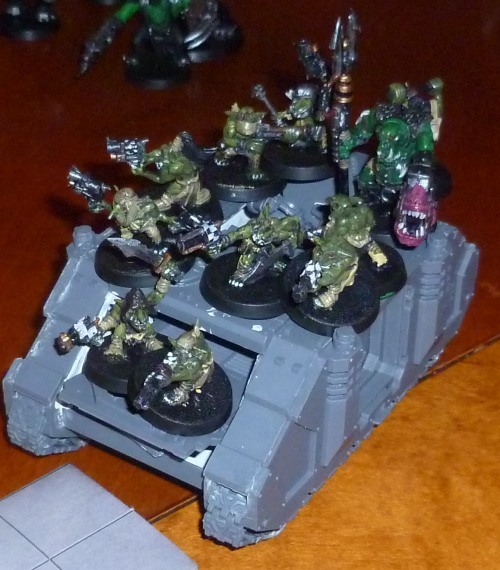 My ork army was composed of the looted rhino with a platoon of 10 gretchin and a runt-herder in transport. Behind that, was my troop of 29 orks and a nob, and I had 2 big shootas and a rokkit-launcher along with 26 boys with pistol and axe. 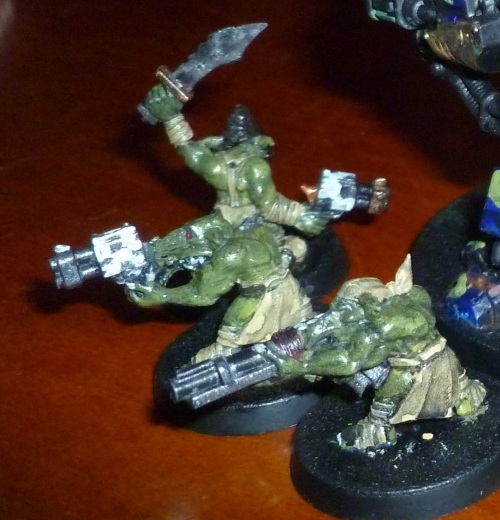 The nob had a twin linked shoota and axe. My warboss stayed with my squad of 5 nobs, and finally, I had my set of three Deff Koptas, known as Mosquito Squadron, hiding behind some rubble. 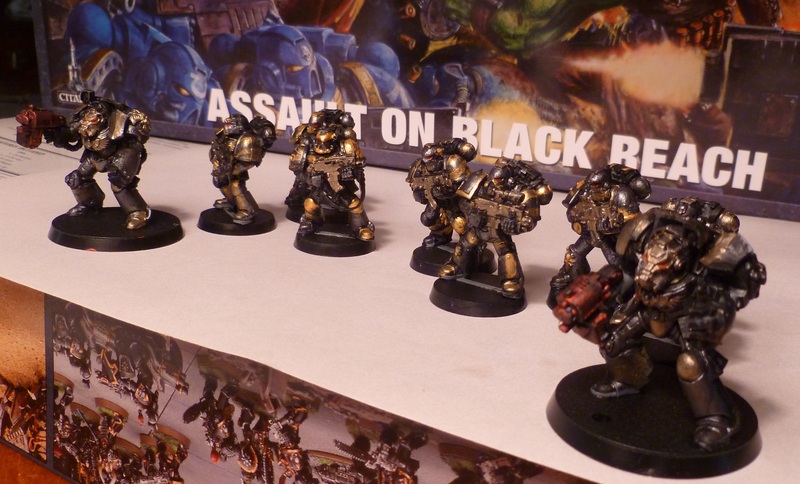 Jack’s battle-force was made up of his 10 space marines split into two squads. One, with the missile launcher, took refuge in a tall ruined building, while the other squad prepared to advance. Besides the space marines, he had a troop of 5 terminators, a dreadnaught, 5 assault marines (beginning off-map for a drop strike) and his captain. The battlefield was made up of a tall golden statue in the center of the map, and four ruined buildings spread outward, and another 4 or 5 piles of rubble. There was a length of road leading out from the statue in all four directions, and it made the battlefield look sort of like a central square surrounded by ruins. Of course, the golden statue was the single objective of the battle, and our forces rushed to take it. Jackson won the roll, but chose to go second, so with a roar of “Wag!” the orks set off with a run. The battle began with my looted Rhino pulling forward towards the statue at full throttle. It was hurriedly painted red, so it went extra fast. Gretchin could be seen hanging from every handhold, and with their heads and weapons poking from every hole and opening in the tank. The nobs ran full tilt and behind them the ork boys also moved up. Finally, the Deff Koptas came tearing around a ruined building to strike at the platoon of terminators, and one of the rokkits had a direct hit, first blood was scored! The ork boys fired their two heavy shootas into the building housing the space marines, but failed to cause any casualties. Nobody else was in range, so it was time for Satyr’s Raiders to retaliate. His troops moved up, then a missile streaked out from the space marines building, impacting amongst my ork boys. Limbs flew and he took out 6 of them with his frag missile. Next my gretchin piled out of the looted Rhino and found cover in, around and under it, and fired at the dreadnought, to no affect. The Deff Koptas fired another salvo of missiles, taking out another terminator, and the ork boys ran forward to stand in the shadow of the golden objective. Captain Satyr led his terminators forward and a huge clash of arms erupted under the beneficent gaze of that long dead hero of Stalingrad. The gretchin left the safety of their Rhino and stormed forward to assault the dreadnought. They did very little damage, but by banging their pistols against the hull of the walker, they were able to daze the pilot, rendering him immobile for a few crucial seconds. The nobs were slaughtered by the terminators, all except the Warboss Zigzag and his nob platoon leader, Iron Claw, who tore through the terminators with their power claws. 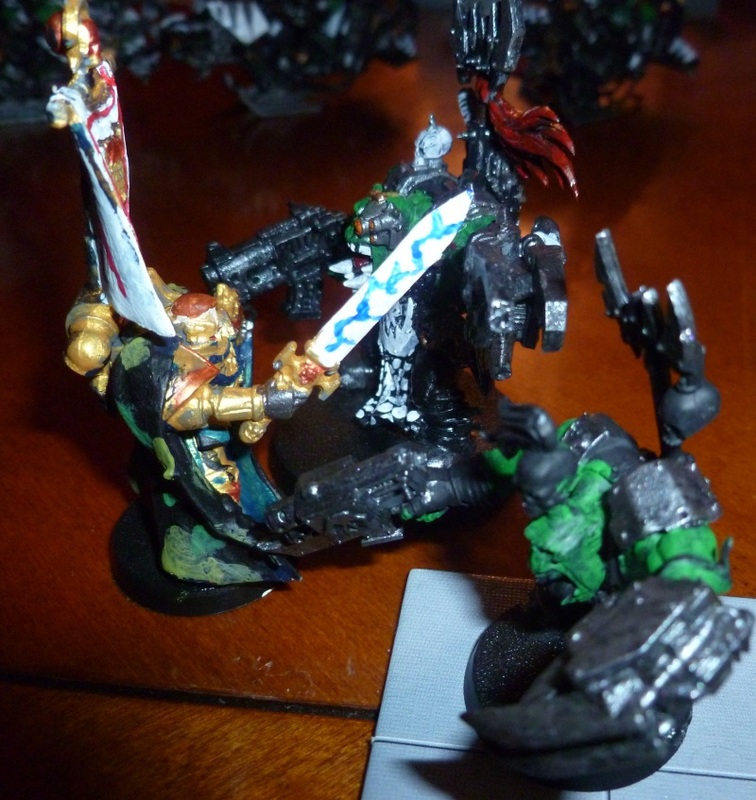 Eventually Captain Satyr stood alone against the two orks, and he started to take wounds. 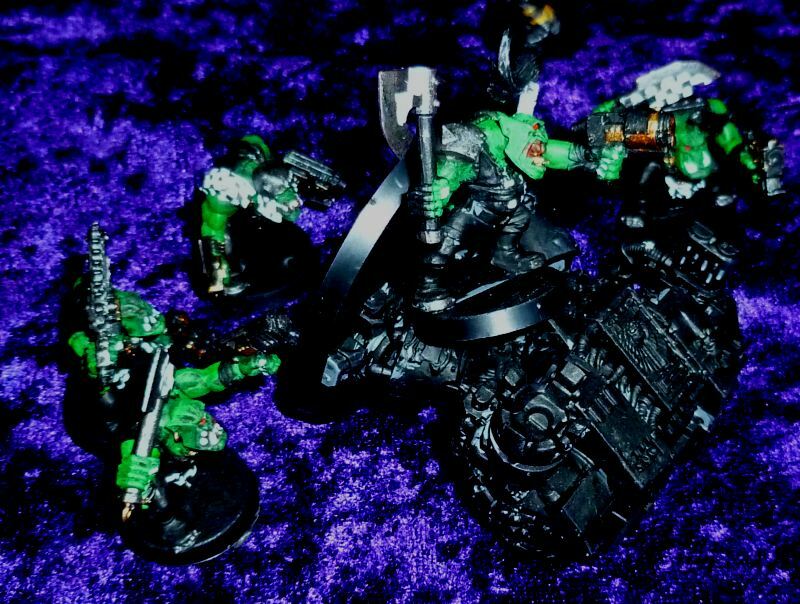 He was nearly dead when the orks took cover against the assault squad dropping in from orbit. They managed to recover the unconscious form of their captain and the first battle ended as a draw, or a stalemate, as neither side was able to take and hold the golden statue. It was another record night at the Basement games with a total of 13 players and 2 DMs. It is about time to seriously consider a third table. My table had 6 players – the same 6 who played last week, so I will dispense with introductions. The DM Jr had 7 at his table, including one or two new kids (its hard to keep track, they’re all so short.) It was rather funny when, just before we wrapped up for the night, I did an informal poll to see if anyone wanted to try out DMing. I got very little response from the adult table, but 5 of 7 hands shot up from the youth table, so we will see what happens, but if we get even one or two new players, it will become a necessity. All in all, it was one of the most fun night of encounters yet. So the heroes of Hammerfast were resting from their recent run-in with the undead. The rotting corpses of dwarf zombies and ghouls littered the entry way of the ruined monastery, and as they rested, Jarren performed a search of the chamber. He determined that at some point in the past the room had been ransacked and there was nothing of interest. 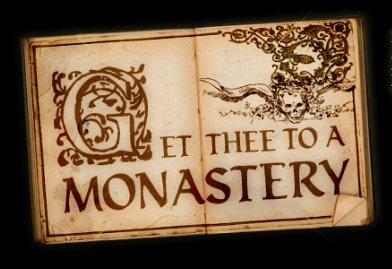 The door leading further into the monastery looked untouched, and the rogue moved to investigate. He found no traps, and was able to pick the lock with ease. He stepped back to allow the dwarf to kick open the door. The doors swung in and the dwarf put his booted foot onto the threshold leading into a long, dark, dingy corridor. But as his boot came down, a change came over the hallway, proceeded by a pulse of magic that was felt more than seen or heard. In the wake of the arcane pulse, the hallway suddenly flared into light, with flickering torches lining the walls, and instead of mottled crumbling plaster on thestone walls, colorful frescoes were shown. 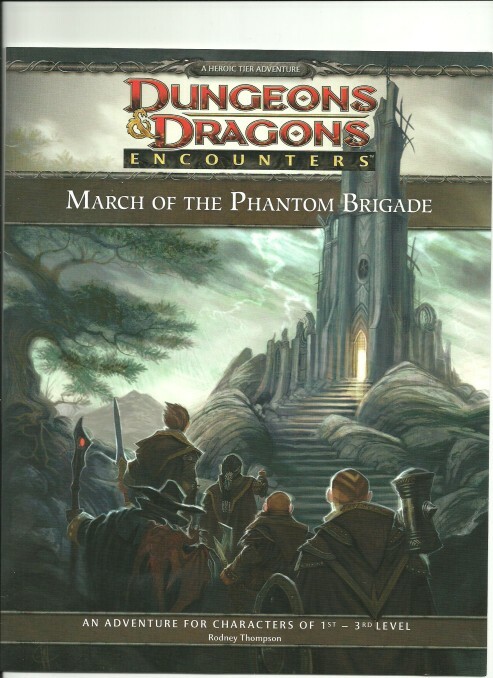 Suddenly from the end of the hallway a group of adventurers stumbled, looking like they were retreating. Some limped, and some had crude bandages, and leading them was Salazar, looking younger and more alive, leaning heavily on his sword for balance. An eladrin next to him said they must recuperate before they face Actherimos again. They then rounded a corner and disappeared from sight. Jarren was interested in two of the characters in Salazar’s band, a wizard and an illusionist, and noticing the arcane wielders, he rushed down the hall to the turn, and found them gone at a solid closed door. In addition, the vision had ended and the hallway was back to its prior dingy look. The dwarf came forward to give another booted kick to the door, and it swung forward showing an empty dark room. Kinara the drow ranger was able to peer into the darkened room and she saw what looked like some kind of barracks room, with four small cots and a chest at the bottom of each. The room looked relatively unmolested since its abandonment. Hagen Fargrim andf Jarren stepped into the room, and instantly it was brightened with another vision as Salazar and his Silver Company comrades rested from their wounds. They spoke of Actherimos the dragon, and then the vision ended. The name Acttherimos rang a few bells, as he was a legendary dragon of immense power, said to be called an earthquake dragon. Where he went the earth trembled, and he was especially hated by dwarves, who hated trembling earth. In times past he posed a grave threat to Hammerfast and environs, but nothing had been heard of the terror for decades. Jarren determined that the visions were replays of past events, caused by the proximity of the arrow of time. Even as he was making these connections, figures covered in dirty sheets were rising from the 5 beds. They were ghouls. And another massive insectoid creature reared its head from the far corner of the room. It was a carrion crawler, and it looked like an enormous centipede with hooked tentacles lining its multiple clacking jaws. Battle was joined. In the first round Fargrim charged the crawler, and struck, but it retaliated by wrapping its tentacles about the dwarfs neck, then trying to pull him along the floor. The dwarf dug his heels in and wouldn’t be pulled, so instead the crawler began scuttling up the wall until it was in the upper corner of the room ,and the dwarf was dangling down, his wee boots kicking ten feet ofrf the floor as the tentacles tightened about his neck. The five ghouls charged the line of heroes at the doorway, keeping them from entering further into the room. Erimikus could not be stopped that easy, and did a back flip over the ghoul in front of hi, then he continued doing backflips across the room until he was behind the crawler, and through a dagger. The rest of the party attacked the ghouls in front of them, unless they could get a step back, like the wizard. 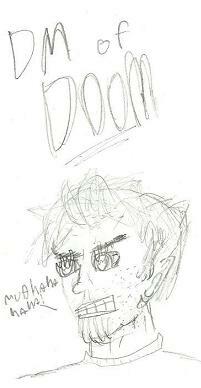 He tossed a lightning bomb into the room which lit up the crawler and three ghouls. Hagen and Valenae slammed their enemies with their war hammers, and the ranger Kinala backed into the corner so she could fire an arrow into the crawler. It hit the creatures head and cracked the hard shell covering it. Brainy goo began bubbling out and running down the carrion crawler, but it had no deleterious effects on the insect. The dwarf was dazed by the tightening tentacles but his arms were free so he did what he knew best, and swung his axe. The head parted from the body of the centipede and they both fell to the ground, Fargrim riding it down like a surfboard over a steep wave. He took minimal damage and stepped off the corpse of the centipede unscathed even though the tentacles continued to hold tightly around his neck. He soon shook them off. Erimikus, behind the enemy lines, was not faring so well, as a ghoul charged him with its icy cold claws. The elven rogue was slashed mightily and fell to the ground. It wouldn’t be so bad except both clerics were having a hard time of it, Hagen especially. Two ghouls surrounded Hagen Das and took out large spoons and began eating the tub of ice cleric. One cleric slashed with his claws of doom, paralyzing the cleric with the cold chill of death. So struck, the second ghoul leaned in and began chewing through the clerics mid-section, tugging on his kidneys. The cleric dropped. Kinala the drow ranger was backed into a corner and had to take out her longsword and slash at the ghoul before her. Her sword bit deeply into its decaying flesh, but not enough to slay the foul beast. The beast retaliated with a savage clawing, and the elf, already knocked well below her bloodied value, was instantly slain by the savage blow. Her lifeless form dropped to the gorund. It was desparate and Valenae had to do something, so she cast a healing spell that gave everyone temporary hit points. This caused the newly slain corpse of the drow rogue to rise again in a semblance of life, but she somehow kept her consciousness and morality, becoming a revanent. The ghouls were dropping by this time,along with the party, and Erimikus, now conscious, crawled up onto a bed, and slinked under its sheet to rise up, sword flaming, and strike the head off the last ghoul, victorious. 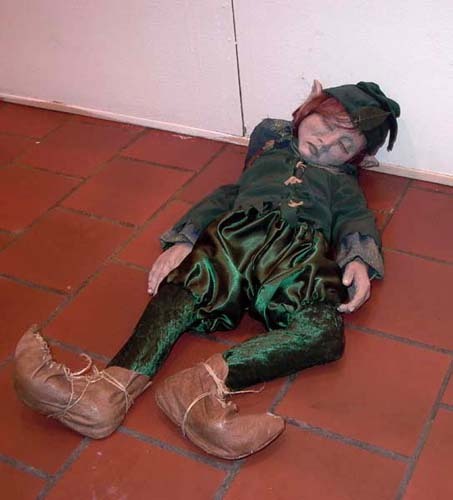 And so ended the battle – another dead elf ranger. I have killed characters on 4 separate occasions, and the whole party once. Of the 4 unique character deaths in 4 seasons of encounters now, 3 of them have been elf rangers. Coincidence – I don’t know! On a side note, the character Kinala who mysteriously came back to life (mostly because she looked so sad sitting there with nothing to do) I am going to bring in a second level drow vampire for her to use if she wants, next week, or let her play as a revenant ranger, if she wants to go that route. Heh. The heroes defeated an implacable foe and if an outsider had wandered by, their blood would have run cold at the sight. The cleric was casting a ritual on the corpses of the basilisks to prevent them from decaying. The paladin was going through the line of fallen enemies gouging out the eyes of the dead. Felipe the druid was stripping the dead of their flesh, all the while humming a tune and planning out a new skin-wardrobe. Even as Poppy had to be stopped from decapitating the bodies, Hex meanwhile was scooping out the brains from the corpses and urinating on everything in sight. In other words, one might think the depravity that these ‘heroes’ released on the corpses of their foes was astounding, but really, they had a plan. They were harvesting the basilisks of anything valuable. Looting has never sunk so low. Eventually they had shorn the bodies of anything worth more than a tarnished silver piece, and moved into the cave complex of the hags. The bog hag was slain but the night hag fled into the caves. The first chamber looked to be the lair of the basilisks, with straw spread over the floor and nothing else of interest. The walls of the cavern were rough and held many niches, openings, and hiding spots. 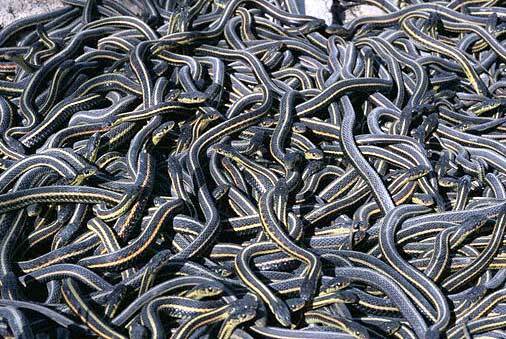 Through these snakes of all size and shape slithered in the shadowy corners o the cavern. Felipe could hear hissing from further in, and moved through snaking passages towards a room with a sunken floor. It was filled hoip-deep with venomous snakes writhing about a central alter upon which rested a shiny black skull of huge size, like a giants skull carved of obsidian. As Ria prepared Tensers floating Disk, Hex examined the arcane mysteries of the skull and decided it must be the object causing the mysterious rock-eating madness. By destroying it, the madness should also be ended. Felipe cast a flaming seed into the chamber, providing a space for Hex to leap down into the chamber and strike the skull. He did little damage but his warlock powers allowed him to slide the skull off its base and towards the narrow ramped exit. He noticed a hole in the platform concealed under the skull, and heard something marble-like rolling around from within. He of course, reached his hand into the portable hole to grab the marble (which was the black pearl they sought) but was struckby a venomous snake from within. He passed out from the poison. Thokk leapt into the room and he was bit by snakes, also falling unconcious. Now Poppy hafd to jump into the chamber, and when Ria lowered the tenser disk, Poppy had to push the sleeping brutes onto the platform to save them. Eventually they made it out and dragged the skull into the clearing and beat it into powder. As it crumbled under their furious attakcs, Hex and Felipe felt their hunger for rocks lessening until it was completely gone by the time the skull was destroyed. The heroes made their way back to the Amber Mansion and found Shalazar Shackleton back in his right mind. He told them how he was once betrothed to Ismelda the elder daughter of Obitello Amber. He has been searching for them for many years since their father took them to this faraway island. Now that they had a black pearl, they would be able to escape the envelope of the Feywild in which the Isle of Dread was hidden, but they needed a ship, since the isle was many hundreds of leagues out to sea. As far as they knew, they had two choices – get the master woodworking chibi fanaton to repair the floundering hulk off the southern coast, which Shazzy Shak admitted was the ship he was stranded when it sank after hitting rocks off the coast. The other alternative was to steal, or somehow join the Githyankii pirates who had a black-sailed ship anchored in the secret bay far to the east. They decided to try both means, and set off back into the Steaming Jungle to enlist the aid of the fanaton. They met Freedom as they entered the jungle, who told them that Gith pirates had kidnapped his father, Friday, and forced him to tell them the location of the well of gold. They planned on dipping Friday into the well the following morning, and Freedom was determined that the Gith should not have access to the well, so he agreed to help them build a ship if they would rescue his father and slay any Gith who knew the location of thier holiest site, the well of gold. The Gith were camped in a ruined jungle temple to an ancient fish god near the well of gold and the party launched an assault, against 3 gith warriors, each with a shining silver sword, a human slaver and his six slave-fighters. And so ends the evening in the midst of battle, to be concluded two weeks hence. Space Rangers to the rescue! 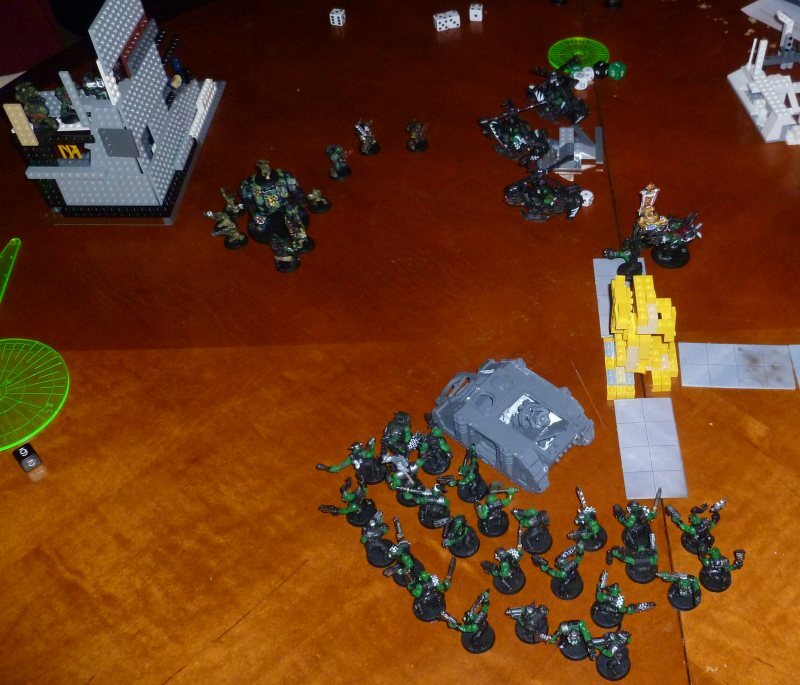 This weekend my son ( whom readers may know as DM JB JR on Wednesdays) bought the Warhammer 40,000 Starter Kit “Assault on Black Reach.” Warhammer – both Fantasy and Sci-Fi 40K – is a tactical wargame that uses miniatures of the same scale as Dungeons and Dragons, i.e. one figure takes up 1” and represents a single unit. There is also a role playing game that goes by Warhammer FRPG. Games Workshop, out of Great Britain, has been producing Warhammer for over 20 years, and it has achieved a fair amount of fame over the years. The lore is rich, gritty, and expansive. It is the pinnacle of painted miniature wargaming. My only experience with Warhammer has been massively multiplayer computer game of the fantasy version. This is my first experience with the science fiction themed Warhammer 40,000 franchise, but I do have lots of wargame experience stretching back all the way to my Squad Leader filled youth. This will also be my first experience with miniatures wargaming, something I have been interested in trying out. Wanting more war in my gaming has led me to search for a fix, and until now I was eyeing the WW2 scene, specifically Flames of War vs. Axis and Allies Miniatures. I think those will now take a back seat due to my son’s fortuitous purchase. The Starter Kit comes with everything you need to start playing, including two introductory armies – the Space Marines and the Orks, which must be assembled and painted. The box also comes with the complete rule book, miniaturized down into soft-cover digest size, some dice, a few burst and range templates, and a thin but colorful booklet that gives stats for the included armies, as well as painting guides and other unit information. The last book also doubles as a “Codex” which is a guide available for each army, and is a must-have item for anyone running an army. Luckily, my local game store loaned me a copy of the Orks Codex, but we don’t have one yet for the Space Marines. The included “codex-lite” seems to have everything we need for the included units, so it will work until we expand beyond our starter armies. The box contains no maps, map tiles, or terrain of any sort. When I asked about this, they informed me that you could use anything as terrain, and indeed some battles featured entire rooms where the terrain was whatever happened to be lying around. It uses a system of measuring and line of sight that allows for this. There are also plenty of terrain features that can be bought or made. Personally I have had a hankering to play in a Staligrad style camapaign of a series of block by block urban street fighting engagements, so I plan on seeking out or making some awesome urban terrain for a planetary conflict I am calling Planet Stalingrad.. I wonder how the mechanics of the game deal with “destructible” terrain. We's da Totin' Goffs, meat want! The figures come in plastic on sprues like most modern models, and have plastic 1” (or larger) bases. 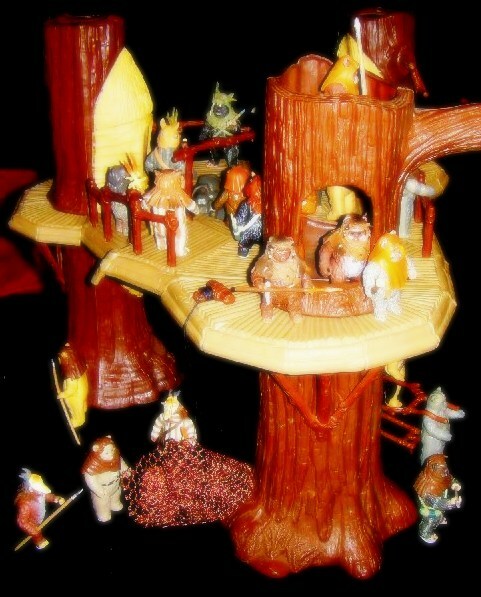 These sets are known for their “ease of construction” and in most cases only one or two gluing were necessary. One thing I am learning about Warhammer is the love of customizability of the armies, and for the orks at least, there were a multitude of heads, arms, and bodies to glue together in whatever combination one preferred. This results in a completely unique army, where even in a group of many of the same unit, each one will look unique. I was surprised about this, and it has become one of my favorite things about the game so far. I relish uniqueness in all things. 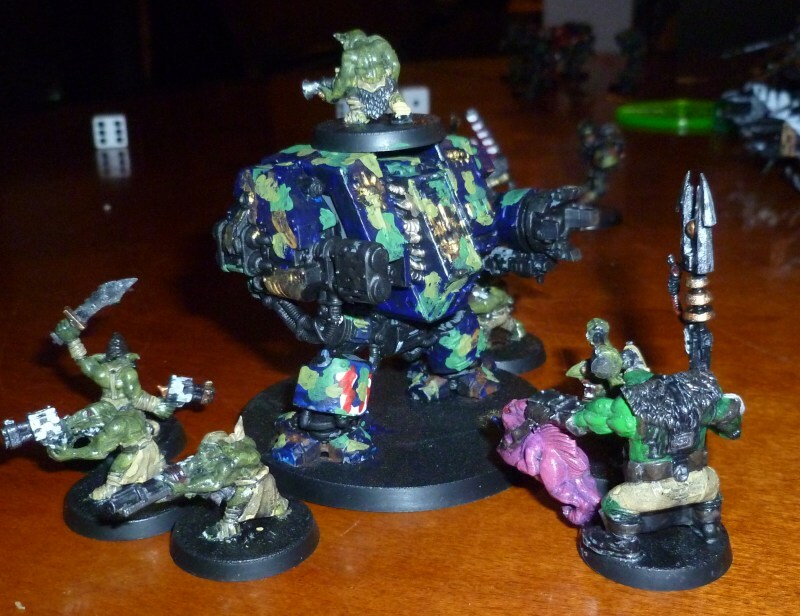 The Empire army did not seem to have quite the same level of customizability as the Orks, but we can make up for that with unique painting schemes, like my son has done. 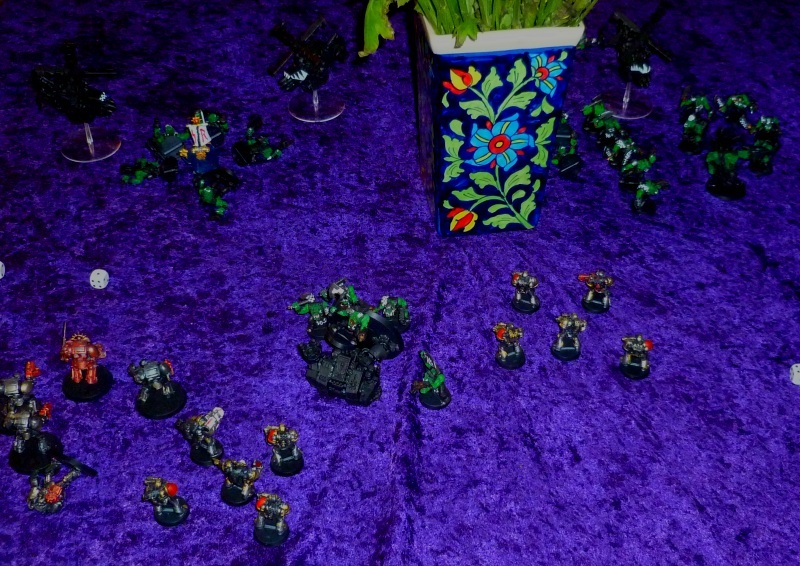 He chose the Imperial Space Marines as his army of choice, leaving me with the Orks. I am ok with that choice, and though I usually prefer armies of quality over quantity, I am looking forward to playing with a different strategy than usual. 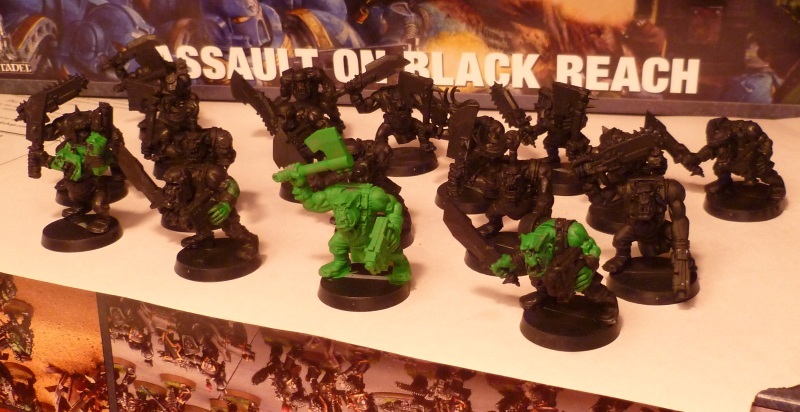 I love these Orks, and have decided my army will be a sub-set of the Goffs who call themselves the Totin’ Goffs. The theme appears to be mainly black/white chessboard pattern. Maybe I will try and come up with a black/white skull symbol. So I have never played the game, and really haven’t even broken open the manual other than to peruse the pages, so I have no idea how the game plays. Right now we are in the stage of getting our armies glued and painted, tough we plan to start playing as soon as we can, and paint isn’t required for that, so who knows, we may have a game on soon. Well we had our first game, or at least the first two rounds of The Battle for Planet Stalingrad Phase 1 the Beach head: Capturing Dzherizinsky Nuclear reactor on the Crystal Sea. Captain Nob-Slaughter charges and takes out an entire squad of Nobs with his power sword. He leads his company by example. A squad of ork boyz attacks the heavily armed walker and a lucky shot puts it out of commission quickly. The orks rip into it like its dinner time. Well that was out first game, and it took about an hour and a half, mostly of looking up each rule as it came up. Most of the rules are straight-forward and make a lot of sense. It hard to get used to hit-wound-save and the rules for vehicles get a little confusing, but I think in genereal, it is a game that will be second nature once the rules are internalized. I love the “true line of sight rules:” Put your eye at miniature level, ad see if you can see the enemy target. There area few areas Im not sure about. like how to keep track of wounds on multiple units, and other fiddly bits, but luckily we will have a crash course in learning the game this Saturday. The son and I will be heading to Basement Games, our local game store (and host of our weekly D&D Encounters) where Saturday is Warhammer Day. Hopefully we will get to play a few battles, even if we are too newb (or our armies are too small) for the tournament. There you have it. We have opened up a Pandoras Box of fun I can tell already. It was another great turnout in Basement Games. After consolidating down into one table (and promptly killing the whole party) last week, this week we are back up to both tables, with a pair of brand new players trying out the game to boot. He played Hagen the warpriest, she played the drow rogue Belgos renamed Kitala. Besides these, most of my regulars were back: Jarren, Fargrim, Valenae, and the rogue Erimikus. DM Jr had a table of four usual suspects. The session began with Jarren picking himself up off the pavement as five of his comrades came around the bend heading for the Great Library, whence Fadyra has made a discovery concerning Salazar. It turns out he was a great hero before he died, but his restless spirit longs to be with his wife, whose grave eternally guards the Ghost Tower of Inverness. The casting of Aldus’ protective ritual caused all sorts of problems for the Vladistones, not the least of which is it kept Salazar from visiting the grave of his wife and prevented the dead wifes spirit from guarding against the ghost tower. Something had to be done and Faldyra had an idea. Vladistone was eventually killed after taking an artifact called the Arrow of Time from Castle Inverness. 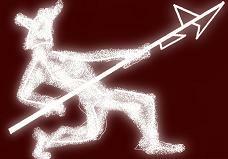 This arrow would not only instantly kill its victim, it would go back in time to a critical moment and kill them then, thus erasing much of their work – but it had to be used on a living creature. The characters could go to the old tomb where Vladistone died,find the arrow, and either give it to Vladistone to return to the ghost tower, or they could use it to kill whatever killed Vladistone, therefore preventing him from becoming a phantom. The party set out. Horses had been requisitioned,a path through the besieged city laid out, and directions given to the old tomb where Vladistone met his end. As they passed through the east gate and headed towards the line of hills in the distance, they saw the massed army of ghosts outside the front gates. As they watched a small force of phantoms on ghostly destriers peeled away from the group and galloped towards them at an angle intending to cut them off before they reached the hills. 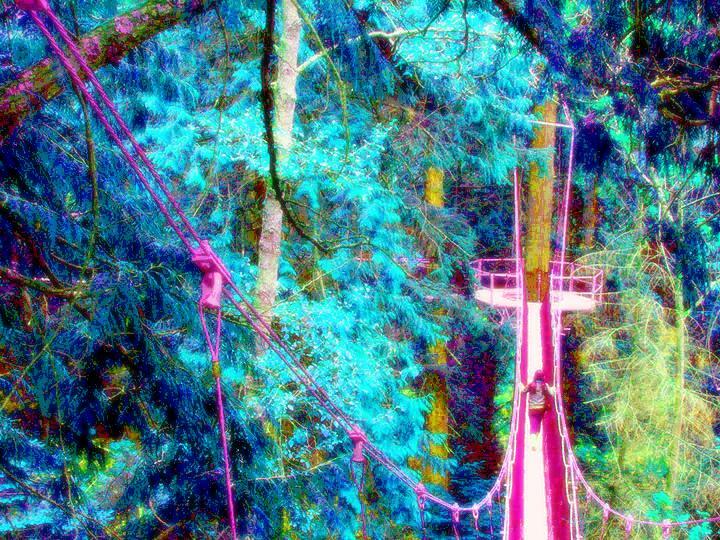 The heroes spurred their horses on and just barely made it onto the rough path cutting through the hills, and were able to gain distance on the ghostly riders who were slower on the steep winding trails. They arrived at the site of the tomb, dismounted and searched the area. Erimikus and Valenae and Kitala were fairly certain no one had been in the area for ages. There were no tracks and the site was completely overgrown. 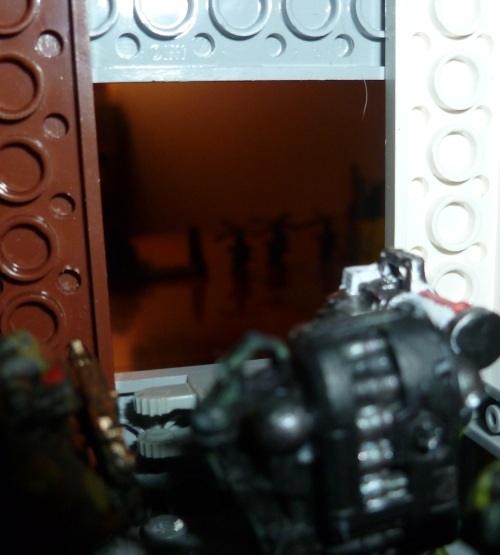 Jarren Hagen and Fargrim studied the great stone doors blocking the entrance and Fargrim became enraged when he found it was of Deurger construction – those evil deep dwarves who every right-thinking dwarf hated above all else. Behind them the phantom steeds rounded a bend and came into the clearing. In the middle rode Vladistone and he warned them they would find a fate worse then death if they entered. He agreed to let them return to the city unharmed, to die with honor, fighting to defend their home. They replied they were going in. Vladistone shrugged and turned away. Hagen and Kitala in front, they spoke the password and pushed the door open. All was dark and dusty inside but they didn’t have long to wait before moans and shambling could be heard. Yep, undead. Nut then a blaze of light appeared at the far end of the chamber as a skeleton burst into flames. The flame did not harm the skeleton and it began clicking his skeletal hands together and formed a large fireball over its head. Kitala was first to go and she hit the skeleton with an arrow that pierced him and wedged his spina against the door behind, slowing the skeleton as it had to pull free. It retaliated by hurling the fireball it had created, which burst against her breast, buning her and igniting her armor. She was luckily able to put the fire out quickly, and didnt need to resort to anyone “making water” on her. Fargrim the dwarf was next to go and he charged to the left, towards a hungry blue tongued ghoul. A brain-crazed zombie lurched forward and picked up a broken arm from a pile of rubble, and Fargrim was further enraged when he realized the broken rubble was once a statue of the god of dwarves, Moradin, and that the zombie used the statues arm like a club – blasphemy! Jarren stood back and used arc lightning every chance he got. In fact, it was the only spell he used the entire battle, and it served him well. His staff of storms added to the efficacy of the arc lightning, and he was lighting up and scorching the undead left and right all night. Erimikus moved into the room and began stabbing into the backs of the undead with impunity. Finally Hagen had his chance and he charged into the fray, mace swinging, an disintegrated the head of the skeleton with a mighty blow. THe batle was fully engaged now, an living and dead fought across the room as the hungry zombies ached for flesh and the insane ghouls attempted to paralyze their opponents with their incredibly cold claws. Erimikus was knocked out,but Hagen got him on his feet, and Kitala attempted to climb a statue to fire down on the zombies, but a zombie slammed into her while on the statues base, nearly knocking her out of the fight. But the heroes prevailed, and before long, the room was empty except for stinking piles of twitching, rotting flesh and broken, crumbling bones. “I am Freedom the halfling, son of Friday!” he reveals, throwing back his blackfeather cape. “We made a mistake in attacking you, but the pirates have been raiding our lands, and all big people are a menace to our race. Let us make peace with a feast!” When the heroes of too many countless adventures to go through here agree to cease fire, he gestures with his golden bough and prorclaims in a piping voice “Chibi chibi FANaton!” whereupon all the chibi fanaton cheer and leap onto the still twitching corpse of the triceretops and begin stripping great lengths of steak for the coming feast. When he returned, with a grave face he asked them of the Phiilosophers Crown rescued from the Well of Gold. He told them the story of his father, Friday, a servant of the wizard Obitello who stole the crown when he fled the wizards mansion. He said his people have a disease and that only the crown can save them. 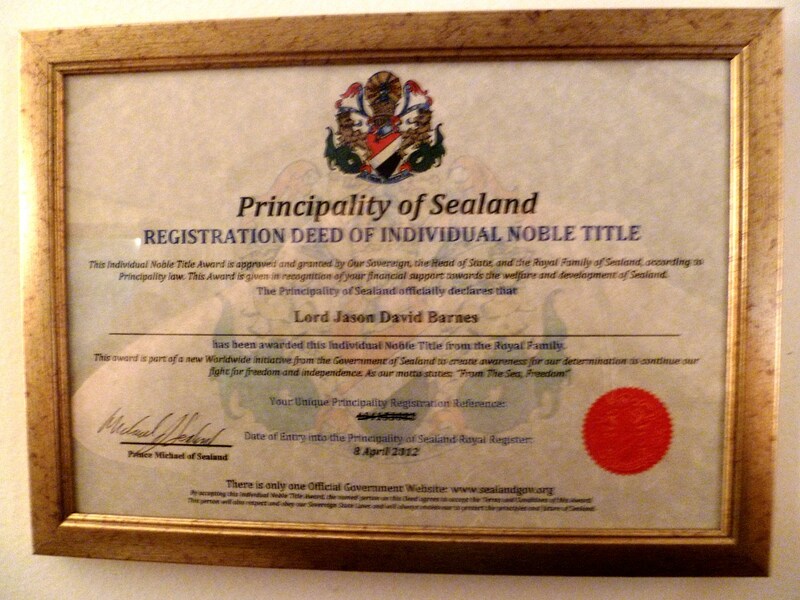 His father threw the crown into the well before he was captured and probably killed by the Githyanki pirates. Freedom calls to a chibi fanaton nearby “Chibi chibi Fanaton” and it glides away and soon returns with another, and they carry a fanaton between them who twitches and tries to escape. The fanaton is trying to escape, and it begins a strange journey north over the mountains and out of the natural habitat of the chibi fanaton, never to return. When the party produces the golden crown, he directs hex (a space pirate) to place the crown on the sick chibi’s head. Once he does, the chibi fanaton immediately becomes stiff as a board, them begins trembling, ntil its tail turns black and falls off, followed by all its hair. A hailess halfling lies their in its place. His eyes open and look around worried before he opens his mouth to whimper “that hurt.” A smile crosses Freedoms lips and he says “Another free halfling” as his relative is led away shaking and in pain. The party is not so sure. He then explains that the madnes is not cured but that now the chibi has the will to fight against the unnatural disease that pulls him northwards. The next day, the chibi fanaton guide them to the edge of the steaming jungle, and to a pass that leads between the teeth-like mountain ridges that separate the regions of the isle of dread. On the other side, the lake awaits them, but the party suddenly realizes they have no boat. The fanaton among them laugh and say no problem. Soon they drag a long log out of the water, and with the flying of chips and sawdust, soon have a twenty foot long canoe ready for use. The chibi wave goodbye and wish them luck. The lake kraken gives them no trouble as they cross, and they arrive at Amber Mansion. The daughters of the Amber enchanter weep with joy to see them return. Soon they place the crown onto Obitello Amber and his sleeping curse is dispelled. He wakes up and thanks them for their aid, and reassures them that since he lost the crown, and Hex found it, Hex can keep it. They find out that even with the crown, Shalazar Shackleton is too far gone, he is trying to escape and go north, so Ismelda and Isolda had him locked in a bedroom. He was also trying to eat rocks. At the mention of eating rocks, a momentary thought flickers through Ria’s, Felipe’s, and Sharia’s mind that eating rocks might not be so bad. Felipe rifles through her pouches, but neither the gold nuggets nor the gems look particularly appetizing. They consulted the wizard and he knew there was a threat in the northern bog, but not what it may be. He mentioned that many of his servants over they years have quit their jobs and sailed or swam across the lake and into the bog. None were ever seen again. The party remembered the statues of halflings lining the paths through the bog like mile markers, and the rumors of a basilisk. They began to suspect the link between that and the mysterious disease, and so the next morning they set out for the bog. They followed a path westwrd through the swamp and came to the western mountain walls that separated the island from the ocean. They could smell salt on the air and could almost hear the crashing waves on the other side of the mountain ridge. After the snakes attempted to coil about as many of the party as they could, the pair of basilisks moved out of the caves. One caused the blood to turn to poison, the venom-eye basilisk, and the other was the feared stone-eye basilisk. Felipe was struck by both. Poppy adealt wth the venom eye. Then behind them came the two hags, a bog hag and a night hag. One was decrepit and old, the other was young and lithe, and both were draped in nothing but long slimy strands of seaweed. The nighthag caused Felipe to fall asleep weven as she was slowly turning to stone, then the hag leapt into her mind, literally inside her head, thrashing about in her brain as Felipe convulsed in her sleep. At the lsst possible moment she broke free and cast the night hag out and shook off the paralysis with the help of her lucky charm. The snakes and basilisks were eventually slain, but we did not find out what happened to the hags. Did they run, or will they plead for their lives? Or do they have some other trick up their sleeves. Find out next week same time same place.